A range of workshops were the highlight of this year’s Southside Arts Festival. Dione Joseph spoke to artists Reina Sutton and Jarcinda Stowers-Ama about how contemporary arts workshops are a window to engaging, enlivening and enriching the community. Southside Arts Festival Urbanesia encompasses all aspects of a true fiesta replete with performances, installations, exhibitions and of course workshops. But as any of the curators or artists will argue these workshops are more than just a chance to dabble in some crafty options – these are platforms to experience and engage with culture in a manner that revere the process as much as the product. 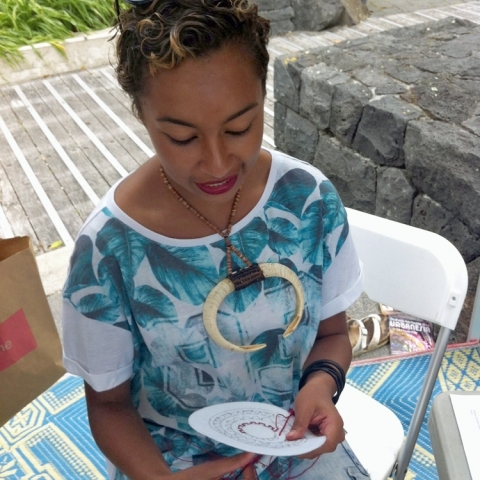 Sisters Reina and Molana Sutton are contemporary jewellery designers who hail from Malaita, Solomon Islands and are proud of the fact their jewellery showcases both who they are today as well as where they come from. So much so that today while you still find practices of traditional body adornments popular in the Solomon Islands there will also be options to use new resources and even recycled materials to connect with traditional designs and art practices. It’s a similar position that Jarcinda Stowers-Ama argues in regards to valuing the work of the Pacific Mamas who run weaving workshops regularly at the Pacific centre and were also part of this year’s Henderson village. “For us weaving is about connection to family and community,” says Jarcinda. As part of Urbanesia this year the Sutton sisters and the Pacific Mamas ran jewellery making and pacific weaving workshops and alongside their other festival neighbours including drummers, mime artists and spoken word poet these highly skilled and talented groups are excited at the opportunities for broadening the conversation with the larger Auckland community over the next few years as the festival continues to grow.